Clinical group therapy forms packet to support licensed therapists, counselors, and other clinical professionals. $49.95 - I keep this cost at about the standard rate for one client fee in group therapy. Having a thorough and professional group therapy forms package is a key component in any private practice or clinic that facilitates group counseling. Yet, what I hear most often from therapists is the stress involved in trying to find the time to write, edit and produce excellent client forms that meet the legal and ethical standard of care, while covering all of the important clinical points. Created for: Licensed and certified clinicians working with facilitating group therapy within their practice or clinic. 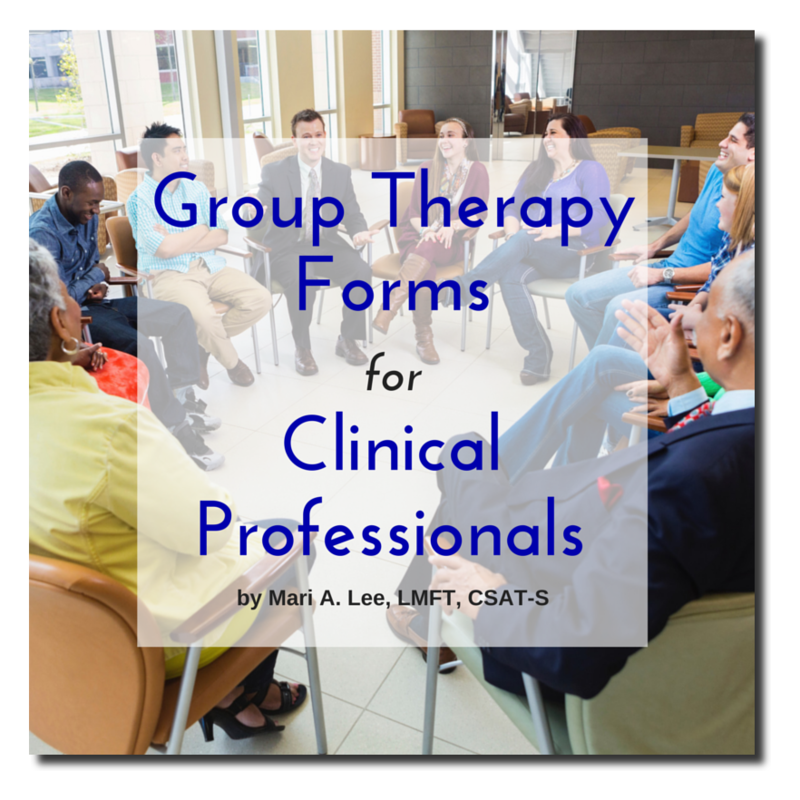 Format: The Group Therapy Forms for Clinical Professionals E-packet is delivered via organized zip file containing customizable Word documents. The forms have been produced in Word for easy editing as you wish. Once purchased, you may “brand” the forms with your own logo and practice information without any copyright infringement. The download is simple - just click on the button below to add to your shopping cart. Note: You will need to customize the forms for your individual practice with your address, phone number and your logo. Once purchased, you will be emailed a link for download that is active for 24 hours. Click on the link in the email, follow the simple steps, and download your copy! These forms are for licensed therapists and clinical professionals facilitating group therapy or counseling within their practices. These forms should not be shared with other clinical professionals without the express written consent of Mari A. Lee, LMFT, CSAT-S. They are for use within the purchaser’s clinic or practice only. Every state has their own governing board and as such, legal and ethical guidelines may differ. Please check with your state’s legal and ethical mandates to make sure that you are operating within your scope of practice, duties and experience and providing the standard of clinical care as mandated by your state.